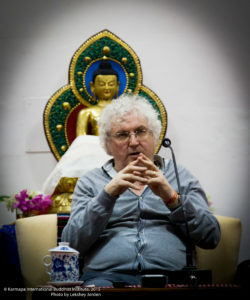 The following is a transcript of Lama Jampa Thaye’s teaching ‘An Introduction to Mahamudra’ given at an evening public lecture at K.I.B.I. in November 2015. If you would like to learn more about Lama Jampa Thaye and his activities, please visit the Teachers Section and Lama Jampa Thaye’s website. K.I.B.I. regularly offers a number of public evening lectures by different scholars and spiritual teachers throughout the academic year. Please refer to our calendar for announcements of special teachings. I will talk to you a little bit about Mahamudra. That seems of course really fitting because this is the seat of His Holiness Karmapa, the embodiment of the Mahamudra lineage. First of all, I thought it would be useful to talk about it in a general way: how do we define Mahamudra through its history, its transmission? We can have a look at the different presentations and the different lineages of Mahamudra. Then we can talk a little bit about the basic approach of Mahamudra to meditation practice. So it is a little about the lineages, and a little about the practice itself but of course, in such a short time, it is just skimming the surface. In the Karma Kagyü tradition, Mahamudra is the name of the most important set of meditation teachings. “Mahamudra” which, in English, means the “Great Seal” -it is almost synonymous with the Kagyü tradition. But first, we need to know where it comes from so as to develop real faith in this wonderful teaching, this wonderful practice. To begin at the beginning, as we always do, the source of the teaching is the incomparable Buddha himself, fully endowed with wisdom and compassion and power. As you know, Lord Buddha bestowed innumerable teachings on his fortunate disciples -so many that, if we innumerate them, we talk about the 84,000 different teachings given by Lord Buddha. We can summarize them in a number of different ways, such as according to the different pitakas (or “baskets”), or according to the different trainings (morality, meditation, wisdom). But mostly, we summarize these 84,000 teachings according to the motivations of the students to whom they were given. And when we do that, we find two main motivations among the students and, therefore, two main categories of the Buddha’s Dharma. For those disciples and followers who, when they heard the Buddha’s teaching, understood it as a way to become free themselves -as individuals- from the causes of suffering and suffering itself, they practiced the teaching in that way. We call those disciples the Shravakas, and we call the teaching given by the Buddha for this individual liberation the Shravaka vehicle, or Hinayana (the Lesser Vehicle). Of course, it is a foundation of all Buddhist teachings; we cannot skip the Hinayana, it is an integral part of all the paths. But then, among Buddha’s students, they were some who had a bigger, a greater motivation, inspired by his own example. They understood therefore that the purpose of receiving a practice and a teaching was not merely to gain their own private freedom, their own private liberation, but rather to actually become like the Buddha himself: a source of inexhaustible benefit for all beings; because, just as surely as oneself is afflicted by suffering and its cause, so all beings are. In this way, we cannot strive for ourselves alone. For those students Lord Buddha gave the teaching we call the Bodhisattva Vehicle (Bodhisattvayana), or the Great Vehicle (Mahayana). If we ask ourselves “From which of those vehicles does the Mahamudra teaching come from?”, the answer is Mahayana; Mahamudra is indeed a very crucial part of Mahayana, as we will see. But then, in the Mahayana we can distinguish two different approaches: there is first the Mahayana teaching that was given for those disciples who want a gradual path to Buddhahood, in which one accumulates the causes that will produce the two bodies or two modes of Buddhahood in the future (the two modes are the Dharmakaya, the body of truth, and the Rupakaya, the form body). For those, the causes are wisdom -for the Dharmakaya- and the accumulation of merit -for the Rupakaya. So in the extensive Mahayana Sutras, Lord Buddha taught the method of gathering those two accumulations. In other words, inspired by bodhicitta -the resolve to become a Buddha-, we set out on a path in which, over innumerable lifetimes we gather these two accumulations of merit and wisdom, primarily by practicing the six perfections. This type of Mahayana is called the common or ordinary Mahayana, sometimes known as the Perfection Vehicle or Causal Vehicle. These are all synonyms. But then, among the Buddha’s Mahayana followers, there were some disciples that had a very sharp aptitude: very, very great characteristics of intelligence (but not much conceptualization), great compassion and so forth. 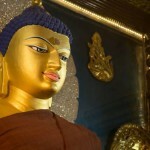 With those students Lord Buddha shared the most precious teachings, which are the teachings of the Tantras. They are part of Mahayana, because we practice them with exactly the same motivation to become a Buddha for the benefit of others. But they are uncommon Mahayana or extraordinary Mahayana; because in the Vajrayana taught in the Tantras we don’t try to just accumulate causes that would lead to Buddhahood in the future. Rather, we understand that the cause leading to Buddhahood and Buddhahood itself are actually simultaneously existing, as the fundamental nature of our mind or the fundamental nature of our being. So we do not have to gather causes that would lead to a fruit in a distant future; we can practice a path in which all three phases -basis, path and fruit- are together. As it is taught in the Hevajra Tantra: all beings are already Buddhas, but this is just temporarily obscured; when the obscurations are removed, there is a Buddha. That is the standpoint of the Vajrayana, or uncommon Mahayana, and it is to this aspect of the Dharma that the Mahamudra belongs. When Buddha taught the Tantras, he did not do it in his ordinary form, but in the form of the Sambhogakaya -either taking the guise of Vajradhara or a different deity, such Chakrasamvara or Hevajra, and so on. In the Tantras, we can distinguish four different sets or collections of Tantras: The Kriya-Tantras (the activity), the Charya-Tantra (the conduct), the Yoga-Tantra and finally the Supreme Yoga, or Anuttarayoga-Tantra. So to be more precise, if we ask to which of these four sets of Tantras the Mahamudra belongs, the answer is: to the last set! It is taught only in the Anuttara-Tantra. So Mahamudra, actually, is an aspect of these Supreme Yoga Tantras, along with Tantras I already mentioned such as Chakrasamvara, Hevajra, Guhyasamaja and so on. So then we can ask: “how is it thought there?”, or “what does it mean there?” Well, first we should say that, among the four Tantra sets, it is only the practice of the Anuttarayoga methods which actually lead to the Buddhahood in this very life. If we practice just the lower Tantras we can gain many accomplishments that will speed up the path, but we cannot become fully enlightened in this life. So that is the characteristic of the Anuttara as a whole. So how does the Mahamudra figure in Anuttara-Tantra? In the Anuttara-Tantras, Mahamudra signifies the transcendental wisdom which is the ultimate siddhi, the supreme accomplishment. In the Tantras, there are two different types of accomplishments, or siddhis: the mundane siddhis, which are qualities such as pacification of obstacles, increase of good qualities, magnetizing and wrathful activities -these are the mundane accomplishments which help to speed up the practice of the path; but the supreme accomplishment is of course the state of complete enlightenment and that is termed, in the Anuttara-Tantra, the Mahamudra or the Great Seal. Therefore it is a synonym for the transcendental wisdom that arises at the end of the path. It is the highest result. This is a very important point. So in the Anuttara, Mahamudra is what arises when you have mastered the two phases of Anuttara-Tantra practice, which are the development stage or kye-rim (Tib., Wylie: bskyed rim) when one practices the deity yoga, and the dzok-rim (Tib., Wylie: rdzogs rim) -the completion stage when you master the winds and the channels and the drops of the subtle body. Through practicing and then unifying these two stages of Vajrayana practice, the transcendental wisdom of Mahamudra arises as a result. This term “Mahamudra” therefore means “that which does not go beyond emptiness”, meaning that there is nothing further to accomplish. In the analogies made, it is said that just as a king who, in order to signify his authority, seals everything in his kingdom with his royal seal, so does the one who realizes Mahamudra understands that all phenomena -samsara and nirvana- completely and in totality do not go beyond emptiness. So the yogin who has realized Mahamudra has this realization, and that is the culmination of the path. Therefore, we say in the Anuttara-Tantra that it is the thirteenth bhumi, the last of the stages: Buddhahood itself. In other words, in the Anuttara-Tantra, Mahamudra is really a term for the goal, for the result, the end of the practice. Also, we say there are four mudras in the Anuttara-Tantra, four seals, and they are called the samayamudra, the pledge seal, the dharmamudra the Dharma seal, the karmamudra, the action seal and the mahamudra, the great seal. These seals arise through the four paths which we are initiated into in Anuttara-Tantra. The first path is the development stage; that is the seal of the samaya, or pledge mudra. The second is the practice of the chandali (or heat yoga), the dharma seal, and the third, the initiation path is a practice lying upon the consort –either real or a wisdom consort- and that is called the karmamudra, the action seal, and then as the result of the fourth and final initiation path, there is the mahamudra, the great seal, and therefore enlightenment is realized. This is as explained by the great tantric master Naropa in his text called Nyengu Dorje Tshikang (Tib., Wylie: sNyan rgyud rdo rje’i tshig rkang), the Vajra Stanzas of the Whispered Lineage. So, in India, Mahamudra was never taught outside of the context of Anuttara practice, the supreme yoga practice -as I said, Mahamudra signified the goal or the result of such practice. 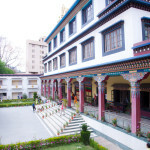 Now the great practitioners of the Vajrayana in India -like the Siddhas, the great realized ones- composed songs for their disciples, songs which express the Mahamudra realization; and when they sang the songs for their disciples, themselves already engaged in Vajrayana practices (the practices of development and completion stages), they were kind of transmitting their realization through the words of the song to their disciples. These songs, called nodrö in Tibetan (Wylie: ngo sprod), were direct introductions pointing out the nature of mind. But they were never sung outside of the context of Vajrayana practice and were transmitted with very great care. The most common of these Vajrayana songs of Mahamudra were called doha. Doha has different interpretations, but most probably it refers to the relaxed style in which these songs were composed. So in time, the doha songs became a special transmission of the Mahamudra from guru to disciple; therefore we still have the transmission of many of these doha songs of Mahamudra, such as those by the great siddha Saraha who composed the trilogy called the doha kor sum, the trilogy of the dohas (the doha of the people, the doha of the queens, the doha of the king), and the dohas by his disciple Shavaripa, and also those by Maitripa, Shavaripa’s disciple -of course, Maitripa is going to be very important because he is the main Mahamudra teacher of Marpa. We also have the dohas of Tilopa and the dohas of Naropa, and in fact of all 84 siddhis; in the history of the 84 siddhis, each siddha has a doha song. So this is the Indian transmission of Mahamudra. Therefore, with Marpa, the Mahamudra teachings came to Tibet, but also the Mahamudra teaching came to Tibet through another great translator, Drogmi Lotsawa, who was slightly older than Marpa -in fact, Marpa had studied with him very briefly before going to India. When he was in India, Drogmi Lotsawa received teachings of different tantric masters but, in the end, his main tantric master was a master called Gayadhara who actually came to Tibet itself and translated the teachings to Drogmi Lotsawa. For Drogmi Lotsawa, that was the main source, and in the Sakyapa School the Mahamudra was considered part of a teaching called the lam-dre, or “the path and its fruit”. So there you have these two main transmissions, and this is important because later on some big discussion or big debate is going to occur in Tibet about what is the real nature of Mahamudra, and that debate will take place between followers of the Kagyüpa and Sakyapa Schools. Marpa transmitted the Mahamudra to his disciples along with the other tantric teachings he had received in India. The main recipient was Jetsun Milarepa, and then of course, Jetsun Milarepa passed the teachings to his main disciple, Gampopa. 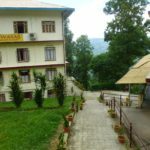 But then, at the time of Gampopa, there is a major development, which is this: Gampopa, before meeting Jetsun Milarepa and receiving tantric teachings from him, had been a scholarly follower of the Kadampa tradition. And having received the Mahamudra and tantric teachings from Jetsun Milarepa, when he meditated very deeply on these things and achieved great realization, Gampopa came to understand that actually there is another kind of line of Mahamudra: not just the Mahamudra as it is presented in the Tantras, but also within the Sutras -in the common Mahayana- can we find a kind of Mahamudra teaching. For Gampopa, this is the teaching in the Samadhiraja Sutra. This is a very important and very long Mahayana Sutra, dealing particularly with meditation. In fact, Gampopa’s coming to Tibet was actually prophesized in this Sutra. So Gampopa, having meditated deeply on that Sutra, thought that what was being pointed to in that Sutra was exactly the same as pointed to in the tantric Mahamudra, but just the method of realizing it was different. This is a very, very extraordinary understanding reached by Gampopa through his meditation on both the Sutra and the Tantra teachings. You see, his point was this: in the Mahamudra we can distinguish view, meditation and action –that is how it is taught in the Indian songs, in the Indian Mahamudra dohas. The view -as that which is to be realized as the nature of reality- is expressed in this way: all appearances are actually none other than mind itself, but if we look into the mind, we see that the mind’s nature is just like space. It has no beginning, no end, no center, no periphery. If we look into the nature of space, we see it is none other than emptiness. In this way, appearances are mind, mind is space, and space does not go beyond emptiness. This is, for instance, how Tilopa teaches in his song about Mahamudra given at the Ganges. But Gampopa said it is exactly the same teaching that is found in the Perfection of the Wisdom Sutras [editor’s note: Prajnaparamita Sutras] -particularly in the Samadhiraja Sutra- and that is found in the Uttara-Tantra. Therefore, there exists in this way a Sutra transmission of Mahamudra, known as a Mahamudra that is not just derived from the Tantras but is being presented in the Sutra tradition. He thought that, for many people, this was an easier, more suitable approach to realizing Mahamudra, so that it is said that, among his own disciples, only to a few did he teach the four tantric teachings that he had received from Jetsun Milarepa -like the yidam practice of Dorje Pamo, and Chakrasamvara, and the six dharmas of Naropa practice. Only to a few did he transmit that, as a way to realize Mahamudra. To most of his disciples, he taught Mahamudra according to the Sutra tradition, as he turned it, without need for initiation, without need for the development and completion stages. With Gampopa, now there is this two-stream Mahamudra: do-lug and nag-lug (Wylie: mdo lugs and sngag lugs), the “Sutra tradition” and the “Tantra tradition” Mahamudra. But this is a kind of very special understanding, very great and unique understanding of Gampopa. Therefore, some masters were kind of critical and quite puzzled by this idea of this special understanding of Gampopa. Particularly in the Sakya tradition –because they also had the Mahamudra transmission as part of the lam-dre, as part of the path and its fruit- they asked questions about Gampopa’s special method. The main Sakya master who critiqued and challenged this idea of Gampopa’s was the great Sakya Pandita. Actually Sakya Pandita lived quite a long time after Gampopa. If Gampopa died round about the middle of the 12th century, Sakya Pandita was only born in 1182. But by Sakya Pandita’s time, the Kagyü had become very, very spread because already in the generation right after Gampopa, four great branches emerged and then after that, smaller branches emerged as well. So the Kagyü was spreading, but all the different Kagyü lines were spreading this special idea of Mahamudra: the Sutra tradition Mahamudra alongside the Tantra tradition Mahamudra. Some of these masters in these lines were even more radical than Gampopa. If you ask: “well, where is Gampopa’s Sutra-Mahamudra teaching? Where can we see this?” You can see it in the Jewel Ornament of Liberation -it is there, that is a “Sutra tradition” text. And then also in his text the Jewel Rosary of the Supreme Path –again, that is like a “Sutra tradition” Mahamudra. But, at the same time, in those texts Gampopa’s presentation of the path is kind of orthodox -that is to say, you need to have a strong bodhicitta, you need to practice the six perfections very properly and so on and so forth. But then, among the next generation, and maybe the generation after that, you get very radical presentations of Mahamudra from masters like Lama Zhang of the Tshalpa Kagyü lineage, who is teaching that it is not necessary to practice either the tantric path or the graduated Sutra path; all that is necessary is to realize the nature of mind, just immediately, and that there is no need for any other system or any other structure. Lama Zhang called this system the karpo chiktub (Wylie: dkar po chig thub), which means the white universal medicine -meaning all you need to do is realize the nature of mind, and there is nothing else to do; you will become a Buddha just by that. This idea of Sutra-Mahamudra and the elaboration of that into this very radical, “all you need is the introduction to realize the nature of mind” idea, is kind of disconcerting to some masters. From the Sakyapa side –Sakya Pandita and those who followed him- this cannot be accepted because the term Mahamudra is just tantric; you never find the term Mahamudra in the Sutra tradition. And besides which, this idea of some Kagyüpas that you don’t need anything else expect this introduction to the nature of mind is very much, they said, like the ideas of the Zen teachers who came to Tibet in the 8th century and who were defeated in the debate in Lhasa. After that debate, the King Trisong Detsen said that the Chinese teaching should never be spread in Tibet -the teaching on instantaneous, non-conceptual enlightenment. Sakya Pandita and others said that this Kagyüpa idea of Mahamudra is novel, is not Indian, it is this Chinese system in disguise, and finally it cannot work -because the nature of Buddhahood is twofold: it is the two bodies of Dharmakaya and Rupakaya, and you cannot realize that only through the recognition of the nature of mind. You need also to have the structure of the path, where there is the path of merit from the Sutras or the development and completion stage from the Tantras. But as I said, Gampopa did not actually teach this instantaneous enlightenment and did not teach that there is no need for a structure, so you cannot say that Gampopa is really refuted by the Sakyapa argument. But nevertheless, the Sakyapa argument is very strong and very important. And to this day, in Sakyapa there is no acceptance of the “Sutra tradition” Mahamudra, but of course, in Kagyü, there is. Then if we look really into the Kagyüpa approach -or in the Karma Kagyü at least- there is actually the approach to Mahamudra which is that of the Karmapas, such as the 9th Karmapa. The 9th Karmapa Wangchuk Dorje, his way of presenting Mahamudra is partly Sutra and partly Tantra; it is what the 8th Situ called the “unification of the Sutra and Tantra Mahamudra”. In this system, we need to practice the ngöndro, and the ngöndro draws upon tantric practices like Vajrasattva and Guru Yoga. Then for the Mahamudra itself, we practice shine and lhaktong, the shamatha and the vipashyana. Of course the terms shamatha and vipashyana are not tantric, and that is again a point that the Sakya critiqued: using words like shamatha and vipashyana is introducing methods that are not part of the Mahamudra, because the Mahamudra is not a path for the Sakyapas; it is the realization itself. For them, all this style in which the Kagyüpas present Mahamudra is in a way not really valid, at least theoretically. But that has really become the main style in the Karma Kagyü: to practice ngöndro in order to purify obscurations, to accumulate merit and to develop great devotion to the master -it is a very special point of the Kagyü system that, if you have very great devotion to master, then there is no need necessarily to practice the development and completion stages because the Guru Yoga is equivalent to them if you have sufficient devotion. It is said that if you have enough devotion in the Guru Yoga, then there can occur the yeshe Phowa chinlab (Wylie: ye shes ‘pho ba’i byin rlabs), the blessing of the transference of wisdom from the guru’s mind to the disciple’s mind, which causes the arising of realization in the mind of the disciple. This is a very special precept of the Kagyü tradition and I think this is really a special distinctive feature of Kagyü Mahamudra. That is really the history, and I wanted to explain this because nowadays many people say “Oh, this is a teaching of Mahamudra; this is this or that or the other…” But if it is not in accord with the Tantras, or in accord with Gampopa’s special Sutra understanding, or in accord with this mix Sutra-Tantra, then it is not a valid presentation of Mahamudra; it is something else, but it is not Mahamudra. It is very important we understand that, important we get a clear understanding or else we will waste our time. Perhaps now we can talk a little bit about how we might approach Mahamudra practice itself. But in a way, in the Kagyü system, without doing the ngöndro it is very difficult to really approach the main practice of Mahamudra. Because first of all we need to clear away our gross obscurations of the disturbing emotions from previous lives and this life, and the best method of purification of obscurations is the practice of Refuge combined with prostrations and the generation of bodhicitta, and of course Vajrasattva meditation. All that part of the ngöndro is for purifying the gross obscurations. Then if we are not enriched by accumulation of merit and wisdom, we cannot make rapid progress and therefore we will not be suitable for Mahamudra meditation. For that, we rely on the mandala offering; that gives us the means of rapidly gathering the enrichment through merit and wisdom. If we did not have such a method, we would actually have to physically practice for many lives giving and patience, and so forth. But we can practice them in the meditation itself, through the wonderful means of the mandala offering. In that way, we gather the necessary accumulations. Also through the Guru Yoga practice, with the confidence that the master who transmits Mahamudra to us is none other than Vajradhara or, if we like, we can imagine he is Gampopa. With that confidence, real devotion arises in our heart to the authentic Mahamudra master who transmitted the authentic Mahamudra to us. Then in this way, his wisdom mind transfers his blessing to us and causes our wisdom mind to blaze up. And when that happens, we really can meditate Mahamudra. 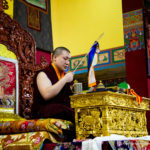 In the 9th Karmapa’s teachings and 8th Situ’s teachings, it is said that the main part of Mahamudra is in two phases: shamatha, or calm abiding (shine in Tibetan), and vipashyana, or insight (lhaktong in Tibetan). Of course, shamatha and vipashyana are terms for meditation in all the three vehicles: Hinayana, Mahayana and Mahamudra; but they are not usually used in the Tantras, so this is a very special use of them, when they are employed in the Mahamudra. Another point which is important to mention is that the Kagyüpa tradition stresses shamatha or shine very, very much in comparison to other traditions. In fact, sometimes it is said that there are just three things in the Kagyüpa tradition: devotion to the lama, shine, and compassion and dedication to others; these are like the three bases of Kagyü practice. Whereas in some other traditions, we might practice shine a little and then try to practice lhaktong, in the Kagyü, the Mahamudra approach is to place tremendous emphasis onto shine, so much so that it is like our mind becomes free of all the clouds and then, when the mind is like space, we can see the nature of mind directly. And that seeing of the nature of mind directly is the vipashyana, the insight from which real wisdom arises. In Kagyü, we say that if you try to go too quickly to lhaktong, to insight, then you will just have a theoretical understanding –it will not be authentic vipashyana, it will be just like you are affixing labels or concepts like “emptiness” and so on, but you don’t have the actual experience. And not only then would you be fooling yourself, but actually such kind of premature attempts at insight make it very difficult for authentic insight to arise for a long time, because it is as if your mind becomes bored and kind of jaded through this premature wisdom, which no real wisdom at all. Kagyüpa Mahamudra teachers really try to push their disciples to practice shine for a very, very long time, so that the mind has this great stability, great flexibility and great openness, at which point the lama, if giving just short instructions on how to look into the nature of mind, then the disciple can very easily be brought to recognize the true nature of mind. Concerning shine; of course in the teachings of the Hinayana and ordinary Mahayana, there are many methods for achieving shine, for bringing the mind into one-pointedness and even-settling. 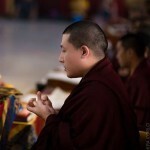 According to the 9th Karmapa’s system, we can use some of those techniques from the lower vehicles to begin shine practice, if our mind is quite disturbed and so forth. But the main instruction for shine in Kagyü Mahamudra is actually just, well, naturalness; we call it more technically “uncontrived naturalness”. 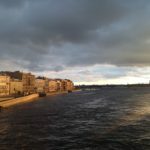 In other words, we try to practice in a way which does not put much emphasis on technique; technique is very dangerous, it can become a way of controlling our mind, rather than relaxing and giving up the kind of attempt to control and manipulate experience. So the principle Kagyüpa instruction is to not hold on to the past, not anticipate the future, but leave the mind naturally relaxed in this present -a kind of fresh, bare experience of the present moment. Not trying to add anything to it, not trying to take anything away, so that by remaining completely loose and fresh in the present moment, whatever arises is just that, just newness, just the present moment. So there is no need to reject it, but at the same time there is no need to become caught up. As we practice this, and begin the practice for just a short period of time so the mind does not become tired -one does not strive too hard to produce this freshness- then gradually what we notice is that thoughts start to become a little less thick, because when we begin to meditate, the first thing we realize -if our meditation is occurring- is that our mind is like a waterfall: thoughts are just flowing one after the other, they come in total succession, one thought joining with another, joining with yet another, and there seems to be no cessation to them, just like the mind in a waterfall or a deep mountain canyon. But as we persist in this simple shine practice, we start to notice that our thoughts become less thick, a little less strong, and gradually we start to realize that there is a kind of space or gap every now and then between thoughts, just for a moment. And of course, as soon as we notice this, we start commenting to ourselves about it, start thinking about it, and the chain of thoughts resumes again. But this gap or this space is very important; we call it the “stillness”, and in Tibetan nepa (Wylie: gnas pa). Because when we experience a little bit of this nepa, this stillness, it is like a confirmation that our meditation is really beginning to work. But then nepa is immediately followed by the gyurwa (Wylie: ‘gyur ba), the moving thoughts. So there is a danger for us that we start to develop a kind of a dualistic approach to our meditation, because we think it is the nepa, the stillness, the gap between thoughts which is really the mind, and these moving thoughts are like the obscuration that is covering it, so what I need to do is put more effort into gaining the stillness -trying to stop the thoughts or block the thoughts- so I can create more space. Of course, if we do that, it is a contrived meditation, it is an artificial meditation and, although we may succeed, it seems, in blocking our thoughts, actually it is just building more tension, and eventually our mind will become very wild and uncontrolled. So we don’t force anything. We don’t try to force more stillness. We just return again and again to the present, and as we retain the basic practice of uncontrived naturalness, whatever arises we don’t interfere, we don’t block, we don’t develop, we let it come and go. Every thought is, as is said in the Dorje Chang Thungma prayer, its nature is newness; we that confidence, we do not need to do anything to the thoughts. If we can practice like that then gradually the stillness comes back, the gap between thoughts comes back again and again and, as it does, we realize that the moving thoughts are not so disturbing anymore. Even when the mind is moving, there is the beginning of a feeling of relaxedness, a kind of unhurriedness, a kind of non-agitation. In other words, it is not just when our mind is still that it is peaceful, but even when the mind is moving; the movement does not agitate us anymore, it does not have the power to disturb us so much anymore. This is how shine is beginning to develop. But it won’t develop properly if we overemphasize the stillness. Rather, we have got to have unconcern, whether there is stillness or moving thought, space or thought, gap or thought, not preferring one over the other. And the signs that shine is developing will especially show themselves in everyday life; our mind is more fluid in everyday life, it is not shaken by objects or by whatever happens. It can retain the spaciousness that it experiences in meditation, and can experience it in everyday life. So instead of compulsively grabbing at pleasant experiences, or running away from unpleasant experiences, the mind retains a kind of evenness, easiness, lightness, and flexibility in everyday life, and these qualities are the characteristics of shine. We can borrow an analogy from Tilopa’s Mahamudra Upadesha for this; Tilopa says that, at first, the mind is like water in a deep mountain canyon or a waterfall –the mind is rushing. Then, he says, gradually the mind becomes like the river in midstream, when it is no longer in the mountains but in the flatland -it still has a force and a current, but it is more gentle. And the third image is when the mind is comparable to when the river enters the ocean -it becomes still and its current is lost in the ocean. Tilopa says that, similarly, in the third stage of the development of shine our mind is no longer broken by thoughts; whatever thoughts and emotions arise, they are immediately experienced and let go. There are no waves, no agitation by thoughts or emotions -the mind is one-pointed and evenly settled. And all this has arisen out of the simple practice of the uncontrived naturalness. 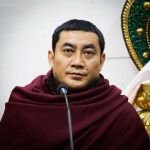 If it is difficult for us to rest with that confidence to begin with then, as I mentioned, the 9th Karmapa says we can use the techniques that are drawn from the lower vehicles, like following the breath or meditating on Buddha images or meditating on syllables and so on and so forth. And also, if particular obstacles arise like very great heaviness –sinking, in other words- or very great scattering and agitation of mind, we can -if we need to- use particular remedies to rebalance our practice. But the best practice of all, the best practice for shine is the uncontrived naturalness. And when we really are experienced in that, then we can say that that is true shine, and with that it is like we are ready to use the pointing-out instructions of the lama. The lama may pose specific questions for us to focus our meditation, because we want to do is to look directly into our experience in meditation to come to realize the view which, of course, is the view that all appearances are mind, mind is space, and space is emptiness. Or to put it in another way, we want to look and see: “Well, actually, is there any fundamental difference between the mind in stillness and the mind in movement? Or are there any differences between mind and appearances?” These are all questions the lama can pose to us in order to set us is off in the vipashyana meditation. Then, when we bring our experience to the lama, and say “This is how I experience it” or “That is how I experienced it” or “I still have this question”, the lama judges whether our experiences are going in the right direction and if so, then he can bring us to the proper introduction into the nature of mind. So this how vipashyana is taught generally in the Kagyüpa Mahamudra system. Of course, this evening, it is more useful to emphasize the techniques of shine. Now one might ask: “Can this system of Mahamudra taught uniquely in the Kagyüpa tradition lead to Buddhahood, if we do not have the development and completion stages of the Vajrayana?” In fact, many Kagyüpas do practice the development and completion stages, as well as practicing this system of Mahamudra. But nevertheless, it is taught by the great masters that, yes, just this Mahamudra system is sufficient; the late Shamar Rinpoche certainly taught in that way. In the Kagyüpa system, it is said that whoever meditates Mahamudra, develops shine and lhaktong in the way it is described, will gradually come to pass through the stages of realization which are called the four yogas: the yoga of one-pointedness, the yoga of unelaborated, the yoga of one taste, and the yoga of beyond meditation. Through stabilizing in these successive levels of Mahamudra experience, we make exactly the same progress and cover exactly the same ground that culminates in Buddhahood as is taught in the other systems. So the four yogas include in themselves the 5 paths and the bodhisattva bhumis. Therefore, we can say that the Kagyüpa Mahamudra path, even if it is not relying on the tantric methods, is a fully comprehensive path to Buddhahood. I think that is really sufficient as an introduction and a clarification of different points of Mahamudra. We should understand it in the kind of non-sectarian sense that, although great masters have some differences and different opinions on some matters, finally these different systems all culminate in the same level of realization. For instance, the great masters of each tradition recognize the authentic qualities of each other, and nobody has doubts about that. There is a little time so if you have any particular questions you want to clarify, or points to bring up, we could discuss them. I know that, because you are all working so hard, you are very tired, so at least you can use a little shine as an excuse to relax a little bit. I mean, maybe sleeping! It was very common in eastern Tibet for the Sakyapas to say “Oh, all Kagyüpas ever do is cry with devotion to their guru, and then sleep in shine!”. So you are fully justified if you have a snooze. Question: We are learning and studying here, and we try to do our best in each class. We see teachers like you and Karmapa, and you do not have your speech prepared but you have all the knowledge. Do you have advice for us, as students and as practitioners on how to become like that? How to be able to explain and better understand the dharma, and be able to teach it to others? How it is it possible to get to this level of knowledge? Answer: The short answer is that is very, very hard work. You are expecting me to say that, but you will see that you should be continuously teaching yourself back the material you are learning; you should be trying to memorize. Of course, it’s not like we started when we were 8 years old like Tibetan monks and nuns who, so early, can build an enormous memory bank, but still we have to do our best. And that means we have to teach ourselves back. You see, when you go to an ordinary Western university, honestly what people do is they remember things for their exams, and then completely forget it. But with us, in Dharma, we cannot leave anything behind so we have to continuously work and we must be remembering and revising, always. Even now, after 43 or 44 years, every year I am revising the teachings –not everything, but I am going over remembering the structures, remembering the key verses, and really working on this. I never give up, I am always doing that. Because luckily, in the 70’s, it was easy to spend a lot of time with lamas, so I was able to find out from them what they had done; and I knew even then that I could not do exactly the same, but I could make the best effort possible. I knew that the key to understanding was hard work and retaining, so I would study and I would test myself. I would read a little bit of the teaching that I had been given and of my notes on it, and then I would test myself: “What was that?”, “What did it mean?” and “Can I teach it back to myself?” Then, I would move on and I would keep doing that. It is really, really hard work, but as you do this your joy the Dharma increases, because it really then starts to affect your meditation. You start to think “Oh! Now I understand what that is!” I don’t just remember it, I understand it now from my experience. Because really, it’s like the Dharma is to become inside ourselves; it is like our bone structure is the Dharma, replacing the ordinary bone structure with the Dharma -the Dharma is inside of us. I always think like this: a Dharma found in a book is not mine; it has got to come in here [points to his chest]. So I concentrated only on the Dharma my lamas gave to me, and I took it inside. What is in a book that I can go and look up, is not going to be there when I die; it is not there even when I am meditating, so it is useless to me. So it must come inside. It’s just hard work, and that is it. That means it is like a job for life, a commitment for life: that one will never give up. But I notice that my lamas –even the ones I knew who passed away- they are always studying, always practicing, in the sense that they too were still learning. They never considered themselves to have finished. Question: Maybe this is too big a question, but can you very briefly summarize the difference between Mahamudra and Dzogchen? Answer: I think I cannot be brief! I can do it more extensively, but what would be helpful to say here? There are so many ways to handle this question. Actually, different lamas have different points of view, to be honest. But one way to answer this -a bit sectarian, in a way- is to say: generally, the rhetoric of Nyingma is very high, so the Dzogchen terminology is very profound and beautiful. But Kagyüpa masters, including those who have received Dzogpo Chenpo teachings, say that the only difference between Mahamudra and Dzogpo Chenpo is the terminology. That is also what my master, the 84 year-old Karma Thinley Rinpoche, said: it is just a matter of terminology. Some Nyingma masters say that Dzogchen is higher than Mahamudra, but that is not the opinion of Kagyüpas. They use slightly different terminology, and one other difference that is simple enough to mention is that, actually, Dzogchen does not usually use words like shine and lhaktong -it is there a little bit, but it is not very important. Most of the Nyingmapa ways to directly introduce the disciples to the nature of mind, to the nature of rigpa, may be through understanding the stillness and movement. But you introduce them to that, and then you allow them to meditate on it. In the olden days, you would have had to do Ngöndro before this introduction; you did Ngöndro, and maybe some yidam practice, and only then the lama would introduce you to rigpa, and then he would say “Now, meditate on it.” But the Kagyüpa approach is: first, develop a lot of shine, then comes the introduction. So that is another way to elucidate the difference between Mahamudra and Dzogchen. The last thing is that there are some very profound masters, like the 3rd Karmapa Rangjung Dorje, for whom Mahamudra and Dzogchen could be brought into one stream. Also, in the 17th century, there is an extremely great master called Karma Chagme, who lived at the time of the 10th Karmapa and was a disciple of the 6th Shamar and 10th Karmapa, but also had connections with Nyingma. Lama Chagme wrote some very profound teachings, like a text called “The Union of Mahamudra and Dzogchen”, in which he presents them as a single system, and the lineage still exists for that teaching, and is very influential among Kagyüpa lamas, particularly from eastern Tibet. So whoever has received that teaching has a way of seeing that they are not really two different systems. Answer: The definition of that is from the 8th Situ, actually. He says it is a union of Sutra and Tantra Mahamudra. Question: Then in both cases, there still needs to be the accomplishment or the realization of shine and lhaktong as part of the path? Answer: Yes, of course. But in the exclusively tantric system, which is common with the Sakyapas -more or less common- it is about development and completion stages, not shine and lhaktong. Question: So within the Kagyü lineage, we also hold this completely tantric line? Answer: Yeah, and actually from most masters have practiced elements of both systems. But the 9th Karmapa’s type of Mahamudra, through shine and lhaktong, and those that practice the yidams, like Dorje Pamo and Chakrasamvara, and the Naro Chödrug (Wylie: na ro chos drug) the 6 dharmas of Naropa. So I really describe ideal types, and the ground is more mixed up, of course. Reality is always more messy than the ideal types that scholars love. For instance, somebody who says they are teaching Mahamudra, but are not giving initiations or cannot give initiations, and cannot teach the development and contemplation stages -this cannot be Vajrayana, but it is possible and conceivable that it is Sutra Mahamudra, only if it is in accord with Gampopa’s teachings. Therefore, one could say “They are teaching the 6 perfections”, “They are teaching Jewel Ornament of Liberation”, and then “They are teaching shine and lhaktong”; this would be authentic Sutra Mahamudra. But one that is not that, or not the tantric line, then it is a different thing; whatever it is, it is not Mahamudra. Question: Is it in the Anuttara-Tantra that you find the four yogas? Answer: The four yogas are from Gampopa. The “four yogas” idea was very criticized by the Sakyapa. From a Sakyapa point of view, this idea is cittamatrin [editor’s note: from the Cittamatra school, or Mind-Only school, it is not anything authentic to Mahamudra. But Gampopa and the Karma Kagyü in general actually say that this terminology is in Naropa. So it is a special Kagyü understanding, and the 9th Karmapa teaches that this is how you evaluate progress to Buddhahood from the Mahamudra meditators. Whereas in the ordinary Hinayana, it is the 5 paths; in the early Mahayana, it is the 5 paths and the 10 bhumis; in the Anuttara-Tantra system it is the 5 paths and the 13 bhumis; for Mahamudra meditators, it is the four yogas. Question: In the Anuttara, there was the samayamudra, and so on? Answer: Oh yes, that is the four mudras. Here is another point: Mahamudra takes its meaning only by context of the other mudras. “Mudra” means “seal”; so, by the development stage, which comes under the first of the four initiations in Anuttara-Tantra, you have the samayamudra, the pledge seal (the visualization itself is a deity). Then, through tummo (Tib., Wylie: gtum mo), through chandali (Sk. ), the practice coming from the second initiation, you have the seal of the upper gate, or the dharmamudra as it is called. Through the practice of equalizing, which the name for the third initiation, you have the seal of the lower gate, or the karmamudra. These are all mudras, these are all seals; so what do we have at the end of the path? You have the great seal, that which cannot be surpassed, that which is the full realization of emptiness. It is called the Mahamudra. Question: And that is why, as you said, only a teacher who has the initiations himself can then pass on or teach tantric Mahamudra? Mahamudra is so amazing, so wonderful. 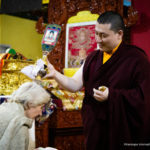 But the most wonderful thing is the presence of the Mahamudra lineage in the lineage holders -His Holiness and Shamar Rinpoche- these are great guardians of the Kagyü Mahamudra. And beyond all debate, beyond all discussion, we can find out for ourselves how the Mahamudra works, but if we want to see it perfectly reflected in another being then we can look at His Holiness, just as we could also look at Shamar Rinpoche, and what they are is the living embodiment and the living proof of the authenticity of Mahamudra. So why not return to the natural stage for a couple of minutes. Or snooze, if you like, and dedicate the merit! I wish you a great time at Kagyü Mönlam and great success in the essays and exams that are coming up. It is very expiring to see you work and studying so hard with the great khenpos. You are making a really big contribution to the continuation of the Karma Kagyü dharma. 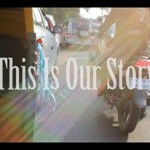 We are all rejoicing in what you are doing and I want to offer my support for this. Lama Jampa Thaye is both a meditation master and scholar, trained in the teachings and practices of both the Sakya and Karma Kagyu lineages of Tibetan Buddhism. 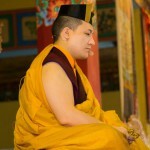 He is authorized as a lama by his two main teachers, Karma Thinley Rinpoche and His Holiness Sakya Trizin. Lama Jampa Thaye has travelled the world since 1988, training a vast number of students in all aspects of the Buddhist path. For more information on Lama Jampa Thaye’s activities, visit Lama Jampa Thaye’s website.